Created to meet the demands of the roofing industry, Pitch Gauge is a roofing property inspection software that is used by over 100,000 roofers a month. Through the software, professionals can personalize roof reports, schedule any necessary meetings, personalize material orders and take pictures of the project. Their roofing software constantly syncs the data from a roofing site to all devices so that the data is always accessible. Pitch Gauge puts the power back into the hands of the Insurance Adjuster or Contractor. Their goal at Pitch Gauge is to make claim processing and project management safer and easier. This claims process is to limit the number of injuries when one has to work on steep roofs and create a safer work environment. Insurance companies and Contractors want their employees safe and to lower workers compensation costs for construction businesses. Pitch Gauge has just the right technology for that. 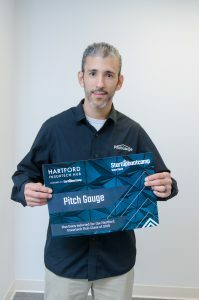 Based in Georgia, Abraham Ventura is the founder and CEO of Pitch Gauge and has relocated to Hartford after being selected for the second cohort at Hartford InsurTech Hub. As we complete our seventh week of the accelerator program, we sat down with Abraham Ventura to ask him about Pitch Gauge and how his journey has been thus far. Where did the idea for Pitch Gauge develop from? In 2008, Hurricane Gustav hit Louisiana. A friend of mine that owned a roofing company asked me to join him to help aid the recovery process. I got into the roofing industry and quickly saw how difficult and dangerous the job could be. Climbing very steep roofs was something I enjoyed, but not everyone felt that way. Many of my co-workers were not physically fit to climb roofs that had very steep angles. I looked for good software solutions in the industry but I struggled to find any. Why did you choose the name ‘Pitch Gauge’? A Pitch Finder is a tool that roofing contractors and Insurance Adjusters know very well. I wanted a name that is easy to say and is easy to remember. The fluidity of the name combined with its relevance in the industry made “Pitch Gauge” a perfect fit. Our target audience is Insurance Companies, Roofing Contractors, General Contractors that still requiring their employees to get on a roof. Companies who want to lower workers compensation costs and want a more efficient measuring tool should consider using Pitch Gauge. What do you think has been Pitch Gauge’s biggest obstacle, and how have you overcome that? Getting the insurance companies to value our solution as a tool to improve their bottom line. After years of using very hard-to-use and inefficient solutions, getting companies to see the value of our product is our top priority. How do you think Pitch Gauge is going to change the Insurtech industry? Our biggest contributions will be fewer injuries and more efficient employees. We have already seen adjusters & contractors that use our software to increase their output by processing up to 150% more projects/claims. Our software will allow companies to both save money and increase their capacity to close new claims/projects. I have gotten other offers to join accelerator programs but none offered us the ability to connect with insurance companies. The Hartford InsurTech Hub has given Pitch Gauge the opportunity to interact with a variety of employee’s inside top companies like Travelers. Everyone at Startupbootcamp has also given valuable feedback which will help us grow in the long run. I received an email from Dawn asking if I wanted to present “Pitch Gauge” during an event at Crawford and Co. I jumped at the opportunity and the rest is history. The experience has been amazing so far. I have met the right people and connected with employees from insurance companies which would have been difficult to do on my own. I really think both the connections and the feedback I’m receiving from everyone at the Hartford InsurTech hub has accelerated the growth of “Pitch Gauge”. All the advice I have received has been great. I feel like the accelerator has transformed the way I think about my business and the steps I will take in the future to make sure I succeed. I have nothing but good things to say about the Hartford InsurTech Hub. Go for it. Especially if your company is geared toward insurance. All startups should jump at the chance to join this program. Make sure that you get in, practice your pitches, put your best foot forward, because once you’re in the information and connections that you make are invaluable. The trajectory of your business will definitely change for the better.